Presently, a total of ten items are listed as Intangible Cultural Heritage in Macao. The Macao society, as a whole, has been making efforts to protect this heritage to pass on the valuable local wealth. Since 2010, Macao Post has selected three items from the List of Macao Intangible Cultural Heritage as stamp issues, including “Woodcarving – Macao Religious Figure Carving” in 2010, “Cantonese Naamyam” in 2011 and the recent stamp issue “Beliefs and Customs - Na Tcha” , aiming to contribute for the preservation and promotion of traditional culture of Macao. On 25 June 2013, Macao Post will launch the thematic pack “Macao Intangible Cultural Heritage”. With the three stamp issues dedicated to local traditional culture, presented in an exquisite cover with an affordable price, that will certainly be a product worth for collection. The thematic pack is priced at MOP120.00. 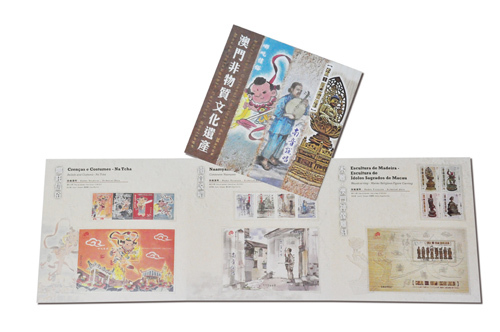 It will be available for sale at the Philatelic Shop of Macao Post Headquarters, Rua do Campo Post Office, Maritime Ferry Terminal Post Office, Airport Post Office and the Communications Museum. Get the opportunity to add value to your collection!